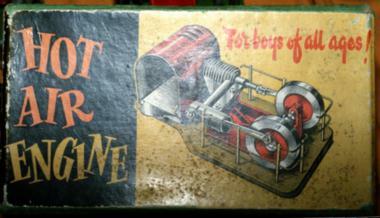 Toy hot air engine sold in the 1950's, price 30 shillings, sold with slogan "Hot Air Engine for boys of all ages!" Davies Charlton was established in 1947, in Barnoldswick, Lancastershire, selling the Wildcat 5cc compression ignition aero engine. In 1956 the firm joined with Allbon and moved to the Isle of Man.